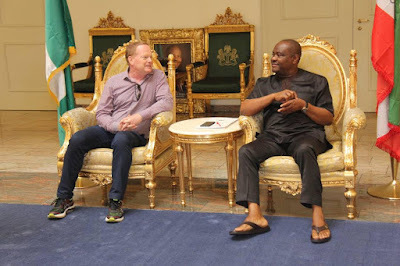 Rivers State Governor, Nyesom Ezenwo Wike has approved the immediate release of N100million as second tranche counterpart fund for the Rivers State Government/European Union Niger Delta Support Programme (RSG/EU NSDP) for two local government areas. The State Government had earlier released the first tranche of counterpart fund of N100million to the EU Development Partners. The two benefiting local government areas are Akuku-Toru and Opobo-Nkoro. Opobo,Nkoro and Kalaibiama (2) Akuku-Toru LGA : Abonnema,Kula and Abissa. Speaking during a courtesy visit by the Minister Counsellor of the European Union to Nigeria, Mr Kurt Cornelis to the Government House, Port Harcourt on Thursday , Governor Wike noted that the fact that the State Government paid the first tranche of 50 percent , proved its commitment to the project. He said: “I have given the authority that by tomorrow the second tranche of N100million be paid. Be rest assured that whatever needs to be done , would be done. “I commend the EU for this programme. We will never be a state that will be backwards in water and sanitation projects”. The governor urged the implementers of the Niger Delta Support Programme component 3 to be transparent as they award contracts for the projects. “Water and sanitation remain key because they are close to the health of our communities. After this project, we expect the EU to give the state more grants , so that we can extend this to more local government areas “, Governor Wike said. Earlier, the Minister Counsellor of the European Union to Nigeria, Mr Kurt Cornelis called for firm commitment from the State Government on the payment of the remaining 50 percent counterpart fund for the RSG/EU NDSP Water and sanitation projects in Two LGAs. According to him, the payment is required to determine the scope of the programme. He said that contracts for the programme would be signed on October 26, 2017. He said: “In principle, we need confirmation of that payment , if we are to carry out 100 percent of the works. We need to take a decision today about the final scope of projects in Rivers State “.